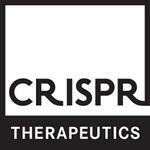 ZUG, Switzerland and CAMBRIDGE, Mass., Sept. 20, 2018 (GLOBE NEWSWIRE) -- CRISPR Therapeutics (Nasdaq:CRSP), a biopharmaceutical company focused on developing transformative gene-based medicines for serious diseases, today announced the pricing of an underwritten public offering of 4,210,526 common shares at a public offering price of $47.50 per share, before underwriting discounts. In addition, underwriters have a 30-day option to purchase up to an additional 631,578 common shares at the public offering price less the underwriting discount. CRISPR Therapeutics anticipates its gross proceeds from the offering, before deducting the underwriter discounts and commissions and other offering expenses, to be approximately $200 million, excluding any exercise of the underwriters’ option to purchase additional shares. The offering is expected to close on or about September 25, 2018, subject to customary closing conditions. Goldman Sachs & Co. LLC, Piper Jaffray & Co., Barclays Capital Inc. and Wells Fargo Securities, LLC are acting as joint book-running managers for the offering. Guggenheim Securities, LLC and Needham & Company, LLC are acting as co-managers for the offering. An automatic shelf registration statement on Form S-3ASR (File No. 333-227427) relating to these securities has been filed with the Securities and Exchange Commission (SEC) and has become effective. This press release shall not constitute an offer to sell or a solicitation of an offer to buy, nor shall there be any sale of these securities in any state or jurisdiction in which such offer, solicitation or sale would be unlawful prior to registration or qualification under the securities laws of any such state or jurisdiction. A preliminary prospectus supplement relating to and describing the terms of the offering was filed with the SEC on September 19, 2018. The final prospectus supplement, relating to the offering will be filed with the SEC and will be available on the SEC’s website at www.sec.gov. A copy of the final prospectus supplement may be obtained, when available, from Goldman Sachs & Co. LLC by mail at 200 West Street, New York, NY 10282, Attention: Prospectus Department, by telephone at (866) 471-2526, or by email at prospectus-ny@ny.email.gs.com; from Piper Jaffray & Co., Attn: Prospectus Department, 800 Nicollet Mall, J12S03, Minneapolis, MN 55402, by telephone at (800) 747-3924, or by email at prospectus@pjc.com; or Barclays Capital Inc., c/o Broadridge Financial Solutions, 1155 Long Island Avenue, Edgewood, NY 11717, by telephone at (888) 603-5847 or by email at Barclaysprospectus@broadridge.com; or from Wells Fargo Securities, LLC, Attn: Equity Syndicate Department, 375 Park Avenue, New York, New York 10152, or by email at cmclientsupport@wellsfargo.com, or by telephone at (800) 326-5897. This press release contains forward-looking statements within the meaning of the Private Securities Litigation Reform Act of 1995, as amended, including, without limitation, statements regarding CRISPR Therapeutics’ anticipated public offering. The words “may,” “will,” “could,” “would,” “should,” “expect,” “plan,” “anticipate,” “intend,” “believe,” “estimate,” “predict,” “project,” “potential,” “continue,” “target” and similar expressions are intended to identify forward-looking statements, although not all forward-looking statements contain these identifying words. Any forward-looking statements in this press release, such as the expected closing date, are based on management's current expectations and beliefs and are subject to a number of risks, uncertainties and important factors that may cause actual events or results to differ materially from those expressed or implied by any forward-looking statements contained in this press release, including, without limitation, uncertainties related to market conditions and the satisfaction of customary closing conditions related to the offering. These and other risks and uncertainties are described in greater detail in the section entitled “Risk Factors” in CRISPR Therapeutics’ Annual Report on Form 10-K for the year ended December 31, 2017, as filed with the SEC on March 8, 2018, the prospectus supplement related to the public offering and other filings that CRISPR Therapeutics may make with the SEC in the future. Any forward-looking statements contained in this press release represent CRISPR Therapeutics’ views only as of the date hereof and should not be relied upon as representing its views as of any subsequent date. CRISPR Therapeutics explicitly disclaims any obligation to update any forward-looking statements.